For frameless cabinets. 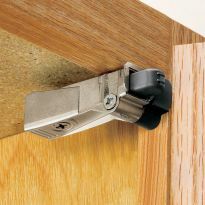 Hinges feature self-closing that starts at 30° and a small footprint that is made to work well with narrow frame doors. For frameless cabinets. 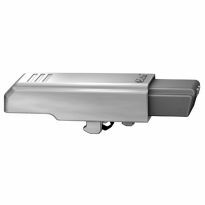 Hinges feature self-closing that starts at 30° and a small footprint that is made to work well with narrow frame doors. 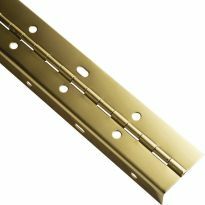 This hinge is compatible with the JIG IT® Hinge Plate Template A #50375 (Sold Separately) for faster, more precise installation. These hinges are an updated version of a similar hinge (#34595), but should not be used together on the same door. 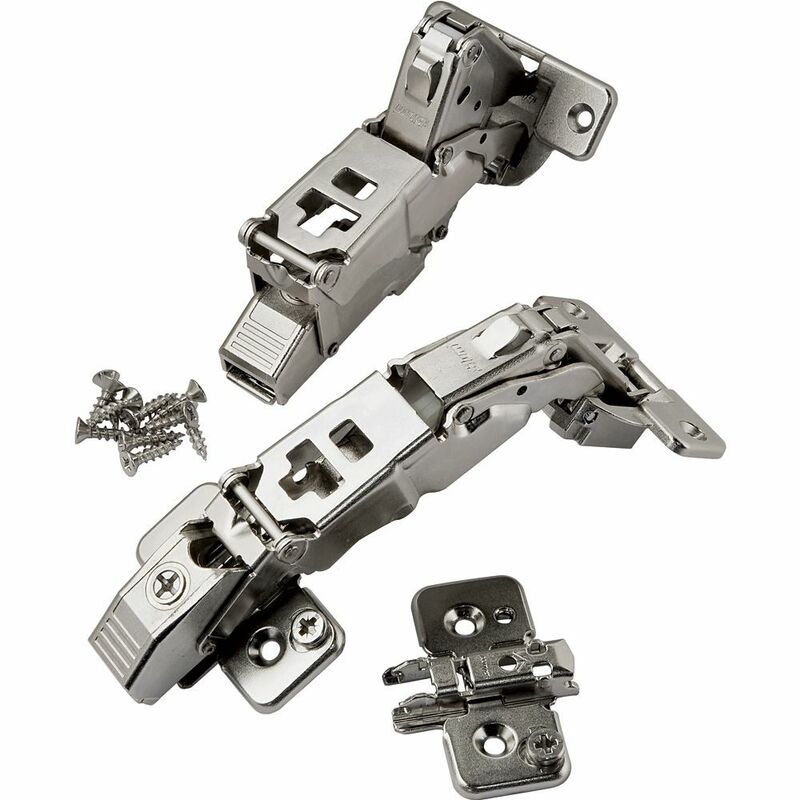 This hinge is compatible with the JIG IT® Hinge Plate Template A #50375 (Sold Separately) for faster, more precise installation. I had to retro-fit an existing door to give it an extended range for opening due to some internal drawers. Easy to use, easy to adjust. This hinge allowed me to install full width drawers behind the doors of these eurostyle cabinets. Excellent quality for a great price. easy to install too. I added the Blumotion soft close to the case and I have three great cabinets, One of them 36" wide with double doors. 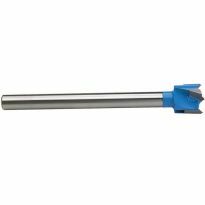 The staff at Rockler is amazingly helpful too. This hinge was the perfect solution to increasing the interior space of a full extension pull out drawer at the bottom of the cabinet. By using this hinge, I was able to build a pull out drawer the was 1/4 from the exterior walls (distance from side walls after install on glides) without any issue of the door being unable to "get out of the way" of the drawer. As well, the hinges "pushed" the door out so that it did not hit the doors to its sides. Excellent product. Feels very well made and sturdy. Wish they were soft close though. Great hinge, very smooth operation. I have 20lb shiplap doors, two hinges per door seem to work great. I used longer screws on the wall side for better strength. I installed these hinges as replacements for existing hinges that only opened 90 degrees. I installed roll out shelving in a cabinet that previously had fixed shelves. Thus, I needed a hinge that would swing the door out of the way of the roll out shelves. My wife wanted a pull-out drawer for her Kitchen-Aid. I built the shelf and realized that the door would block its travel. There hinges solved that problem. They are large and work just as the photos and description claimed. Excellent, strong, and quiet. My cabinets came with the house and are not solid wood. I had to drill out the holes slightly on the cabinet side of the hinges to mount them. The cabinets are particleboard and the screws are larger and more coarsely threaded. Plenty of room and they went in very nicely. I would buy them again. Glad Rockler had them, similar hinges are hard to find. We use these hinges for cabinets where the extra door opening degree is required. We have yet to have any difficulty with them. I was disappointed to find that there were no instructions with measurements included with the hinges. Remodeling contractor and cabinet maker. 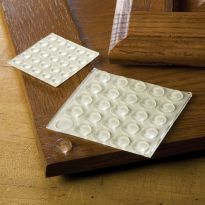 Used them on mirrored and recessed cabinets in a mirrored wall of bathroom. The worked great and are easy to adjust in all directions. Client loved the way they turned out because they allowed almost no gab between mirrored panels. I purchased these hinges after making the rookie mistake of installing full extension shelves without making allowance for door protrusion into the cabinet opening. After installing the hinges, the cabinet doors now open completely clear of the cabintet such that my shelves now pull-out without interference. 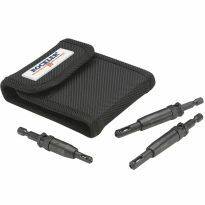 The action and quality of the hinges is excellent. The only reason I rate this product at a 4, not a 5 is due to their sheer size. While the doors no longer protrude into the cabinet interior, the hinge itself protrudes 1.0" with door open and 2.25" when closed. This compromises available shelf space when items on the shelf must miss the hinge when extending the shelf. This fact combined with the product's healthy price will cause me to build a narrower shelf and use cheaper, simpler hinges next time. Hinge works great. Allows full shelf extension. Just cannot figure out how to attach the included "cap" to cover holes. Gave up and just left them off. The hinges I had purchased did not allow my sliding drawers to open because the doors were in thje way. I have full width pull outs and needed these hinges to allow doors to swing out and away from the cabinets inside width. HOPEFULLY THIS HINGE WILL REPLACE AN EXISTING BROKEN HINGE ON MY CABINET DOOR. OTHER THAN VISUALLY CHECKING, NO OTHER WAY TO VERIFY THE FIT/ACTION. I have a corner cabinet that had a broken hinge. I could not find a hinge at any local store and went online to buy a pair. I simply cannot have protrusions in my life. Hoping it's the correct hinge. To match ones I already have. needed more than 90 degree opening on door. Replacement set for the older Blum 155-degree hinges, for a lazy susan cabinet face. A great match for replacement of a broken hinge. I need a zero protrusion face frame hinge with a 1/2" overlay? What would you recommend? 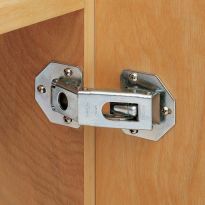 In 2007, I purchases a blum 165 degree zero protrusion hinge to replace 1 of 4 hinges on a murphy bed door. I can now only find a 155 degree. Is this the only replacement hinge available? Is the 165 no longer produced? Thanks. Yes. It's the only one I found that was close to the 165* I had used years earlier. Is this an inset hinge or an overlay? how much weight per pair will the hinges support ? 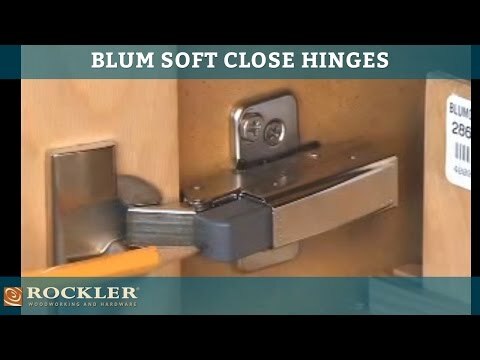 BEST ANSWER: Blum's own literature for 35 mm cup hinges in general states door weight limit for two hinges is 15 lb, 3 hinges 30 lbs, 4 hinges 45 lbs, and 5 hinges 60 lbs. Can't find any specific limit for the 155 degree hinge. 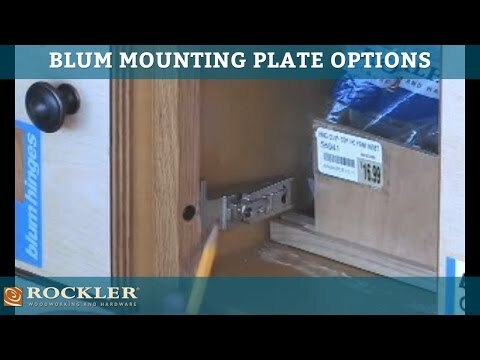 BEST ANSWER: I think this may be a question better answered by th Blum company or the Rockler stores. I would not want to give you information that is not correct. Thanks. 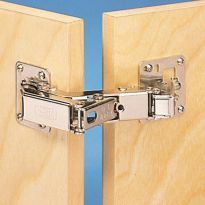 Can a 155 Zero Protrusion hinge be used on a frameless inset door cabinet, or is it only for overlay doors? BEST ANSWER: This are only for overlay doors. 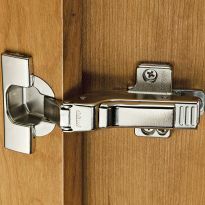 Do they make this hinge for an inset door, I need to have the door drop down and clear the zero tolerance door that that sits below it? BEST ANSWER: Not exactly sure what you mean. I used this hinge for an inset door on a cabinet with a face frame. The door, however, was built with a border that was thicker than the frame. This resulted in my having to add wood inside the cabinet box until the hinge was flush with the face frame. Took some time to get it just right, but worked perfectly. Hope this helps. how much clearance between the edge of the door and the front face of the cabinet is there when the door is open 90 degrees? Not the protrusion but the dimension of the gap perpendicular to the protrusion when the door is opened? do the hinges come in pairs? BEST ANSWER: Yes, they come in pairs (2 in one pack). 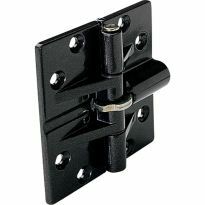 can you add a soft close damper onto this hinge or do I have to buy a separate damper to install in a different location?